I do solemnly swear that I will support and defend the Constitution of the United States against all enemies, foreign and domestic; that I will bear true faith and allegiance to the same; and that I will obey the orders of the President of the United States and the orders of the officers appointed over me, according to regulations and the Uniform Code of Military Justice. So help me God. The day before taking that solemn oath of enlistment I celebrated my 19th birthday. Like most new recruits I was young and not well prepared for those days of training, discipline, rules and the rites of passage just ahead. But, I learned a lot and even shaved for the first time during those first few weeks. I’d like to think I grew up a lot during those next four years. The military changed my life for the better and it’s been a big part of me ever since. It’s an honor to be a veteran. When I die it’s my wish to be buried in a Veteran’s Cemetery. If I’m still in the Seattle area my final resting place will be the nearby Mt. Tahoma National Cemetery. I had the opportunity to visit there two summers ago and it’s a beautiful, tranquil place. Nestled among a thick forest of trees, with a spectacular view of 14,000 foot Mt. Rainier to the south, the grounds are immaculate and the headstones placed equidistant in long, straight, carefully measured, perfectly aligned rows. I don’t expect to arrive there atop a caisson, nor will a squad of smartly-dressed, uniformed, active duty military be on-hand; but I hope, when I’m carried to my grave, my casket will be draped with the American flag and the occasion marked by military honors. At the close of the service I envision a lone bugler playing the 24 notes of “Taps”. Then, an honor guard of veterans will remove the flag covering the casket. It will be folded with dignity and given to my children, “on behalf of a grateful nation.” In those few short minutes one of the things I did right will briefly be remembered. This ceremony of respect is a final honor available for all our veterans. The flag a keepsake to be preserved and treasured for generations. I love that flag. It’s a symbol of pride and of honor to all the veterans who served our nation, all giving some, while others gave all. The flag is a reminder to avoid compromise and to remain steadfast on the long road that has brought our country immense opportunity, prosperity and security, much of it to the credit of the American vet. No matter the headlines we see or the speeches we hear — and regardless of those who within our midst ridicule and say we’re not a perfect country, pointing out our every flaw… that may be so — but, we’re still the greatest nation on earth. beyond the pain and suffering that inflict so many across the globe. There are only two defining forces who have offered to die for us. One is Him whose birthday we will celebrate next month. The other is the American soldier. The first died for our souls while the other for our freedom. 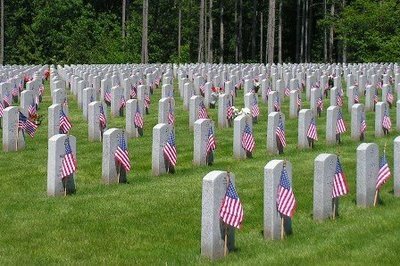 I am grateful for our veterans on this day and every day and especially for those who have paid the ultimate price. Take the time to thank a soldier serving today. In their own way, whether in giving a few years or their entire lifetimes, they have given us, and millions around the world, an opportunity to be free. What we do with that opportunity is up to us. appreciate those who were less “lucky” than I. Excellent and very moving post, Rick. beautifully written as always. Thank you for your service. Thank you for serving our country and for writing such a great blog. Keep it up. FYI, some cemeteries do provide a caisson. The VFW and American Legion will provide Taps and a gun salute. Hopefully, you will not need that for many years to come. Thank you for visiting and for the nice comment and information. Thanks again. I appreciate it. I missed this the first time around. Thanks for sharing again…and thank you for your service!! !